This Polyester Table Skirt Represents Only a Fraction of the Entire Array! 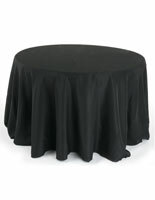 Other Colors and Sizes are Also Available for these Tablecloths! With Such a Complete Inventory, Customers Will be Able to Find the Right Table Skirt Easily! 11 ft. diameter fits over large banquet tables. Polyester construction is durable & machine washable. Coordinates with satin & organza overlays for deluxe style. 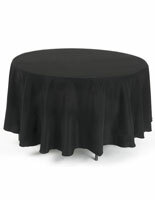 This table skirt for trade show use is ideal for commercial environments due to its black color. 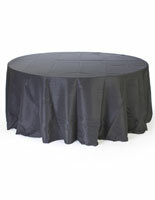 Linens that feature black color easily fit in with any décor or atmosphere. 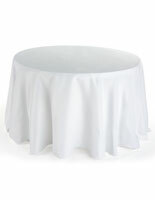 The round table skirt has a draping design, which provides a deluxe look when contrasted with shorter linens. 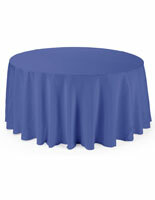 While commercial users love these trade show tablecloths, they are also appropriate for domestic applications. A throw with this combination of durability and style is an incredible value at wholesale price! 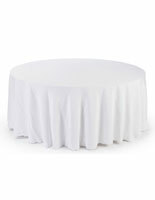 This table skirt that is ready to ship is manufactured for commercial use, such as in the hospitality industry or the vendor circuit. The cover is made from a high quality polyester fabric. 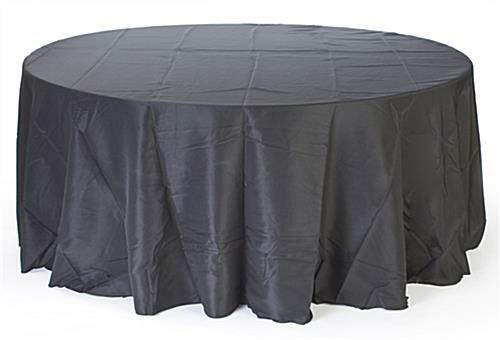 Polyester tablecloths are preferred by hotels, banquet halls, restaurants, and job fair exhibitors for its durability and utility. The table skirt, like a tablecloth or table runner, is machine washable. In addition, these covers are wrinkle resistant. 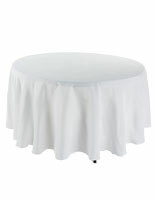 As an added bonus, this table skirt is much less expensive than throws made from other materials.